BigGameCountdown Toolbar is classified as a potentially unwanted application. It belongs to Mindspark Interactive Network, which is a company responsible for a variety of similar programs like RetroGamer Toolbar, Webfetti Toolbar, AudioToAudio Toolbar, and others. 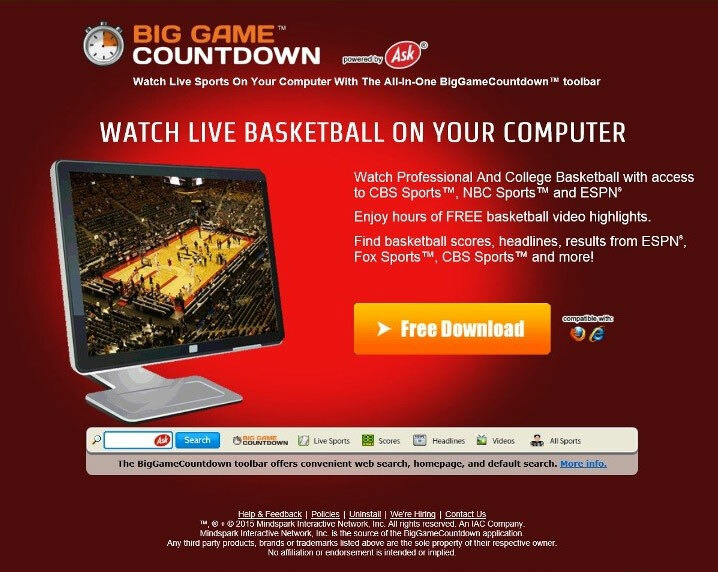 The software promises to provide you with access to CBS Sports, NBC Sports and ESPN, where you could watch professional and college basketball. It also states that it will allow you to enjoy hours of basketball highlights, find basketball scores, headlines, results and more. The website contains a working download link, so it can be downloaded from it. However, the program also travels bundled with freeware. If you have been experiencing any issues since its arrival, we suggest that you delete BigGameCountdown Toolbar. How does BigGameCountdown Toolbar work? If you install BigGameCountdown Toolbar without paying too much attention to its installation wizard, you may not realize that you have also agreed to changing your browser settings. The toolbar is powered by Ask, so after it gets installed, it switches your home page to home.tb.ask.com and your search engine to search.tb.ask.com. Although Ask Search can be trusted, you should know that it will provide you with sponsored content. Some computer users prefer to go back to their original search tools, which is why they decide to terminate BigGameCountdown Toolbar. After you install the software, you may start noticing other unwanted symptoms as well. This is especially true for computer users, who acquired the toolbar in a freeware bundle. If that is how it ended up in your system, it is possible that you also have other unwanted applications that cause various banners, pop-ups and ads to appear on your screen. We suggest that you stay away from all commercial content that you see in your browsers until you get rid of BigGameCountdown Toolbar. In order to eliminate BigGameCountdown Toolbar from your browsers, you will have to uninstall it from your system. Since it most likely also altered your browser setting, after you uninstall it, you will have to reset your browsers. You can terminate BigGameCountdown Toolbar manually or you can do it automatically. We recommend the second option as it is much more reliable. If you download and install the anti-malware utility, you will be able to delete BigGameCountdown Toolbar as well as other unwanted programs that may be present in your system. However, if you choose to remove BigGameCountdown Toolbar manually, you can use the instructions presented below. we found ur site is much helpful to us! If you keep up the good job we’ll come back to ur weblog!